Fergus Bisset discovered an abundance of golfing opportunity on the beautiful, tropical island of Mauritius. When I was a kid, mention of Mauritius, much like the Seychelles or the Maldives always conjured thoughts of a distant, semi-surreal paradise for me. I imagined palm trees, white beaches, turquoise seas with land and waters teeming with unusual wildlife. The sort of place The Swiss Family Robinson were shipwrecked. Older now and perhaps more cynical, ok definitely more cynical, I wasn’t quite picturing building tree houses with John Mills as I planned for a visit to Mauritius earlier this month. Still, I was pretty excited at the prospect of travelling to, and golfing on, a faraway tropical island… I’m not that cynical! It turns out that my childhood imaginings were pretty much spot-on (minus the pirates and tigers.) Mauritius is a beautiful island nation, with stunning scenery both coastal and inland, offering a tremendously warm welcome and as I would discover, a wealth of golfing opportunity. Let’s not beat around the bush, Mauritius is quite a long way from Britain. It’s a 12-hour flight from London Gatwick. But, for a couple of reasons, that’s not nearly as arduous as it seems. Firstly, the time difference is only four hours so there’s little or no jet-lag to deal with. Secondly, the direct flight is with British Airways and they, in my opinion, continue to deliver the very best long-haul flying experience, with a superb in-flight system, brilliant and friendly service, great food and (just a little) booze. When travelling to an island paradise, it’s worth pulling out the stops and travelling BA Club World adds a real sparkle to the journey. Making use of the opulent lounges, luxuriating in a flat-bed seat, sipping champagne and wielding real cutlery, one is transferred to a more refined age of air travel. Mauritius has a reputation as a romantic getaway – a favourite with honeymooners or couples celebrating significant anniversaries. That’s understandable, it’s a very romantic place with its endless palm-lined beaches, bath-tub warm shallow seas protected by an island-circling reef, gorgeous sunsets and an abundance of flowering plants and trees. But, Mauritius is far from being a one-dimensional luxury island resort destination. The island has a long and interesting history that is evident in the language, architecture and culture of the place. The Dutch were the first to colonise in 1638 and then the French from 1715. During the Napoleonic Wars, France used Mauritius as a base from which to launch attacks on British commercial ships so a Royal Navy expedition under Commodore Josias Rowley set out to capture the island. France surrendered Mauritius to the British in 1810 and it remained a British colony until gaining its independence as recently as 1968. The British influence is still strong in Mauritius. The schools follow the British Education system and O-Levels and A-Level exams are carried out by the University of Cambridge, they drive on the left side and road signs are all of British style. Also inherited from the British (well the Scots,) the island is now a real golfing destination with nine championship courses. I had read good reports and seen spectacular photos plus coverage of the Mauritius Open and I wondered if the golf would live up to expectations. It did. the In my short visit, I played three golf courses, all of exceptional quality, presented in immaculate condition and all delivering quite different playing experiences. The first course on our trip was to be The Heritage Golf Club in Bel Ombre. Designed by Peter Matkovich, a Zimbabwean professional golfer turned renowned course architect, the course currently plays host to the AfrAsia Bank Mauritius Open, it was the first event to be tri-sanctioned by the Asian, Sunshine and European Tours. Although this is a championship course and a venue for top-level competition, it’s not prohibitively difficult. A variety of teeing options mean that all golfers can find a yardage that suits their ability and, although there are plenty of hazards to be avoided, the fairways are fairly generous and there tends to be a reasonable bail-out option from most tees. Many of the fairways are lined by dense grasses and, although punishing, it actually simplifies play. 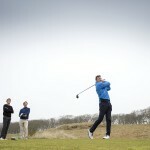 Hit into the real thick stuff and the ball is gone – move on and forget about it! I like that, it keeps play moving. Mauritius is a volcanic island and there’s evidence throughout the countryside and on the golf courses too. Volcanic rocks of varying sizes are a striking feature around the fairways and I can confirm, as can my 54-degree wedge, that you can’t play a golf ball through them! There’s a great variety of holes at the Heritage Golf Club from driveable par-4s to long and sweeping par-5s. There are tremendous vistas of the surrounding mountains and down towards the coast and there’s plenty of interesting flora and fauna to examine. We saw mongoose, giant fruit bats, a monkey and an assortment of colourful songbirds. Sipping on a beer on the veranda at the Heritage Club, we considered our journey and our first sortie onto a Mauritian golfing pitch. On all accounts, we were impressed. The night flight had meant we arrived feeling fresh enough to play and we had made the very most of our first day on the island, playing a rather excellent golf course. But we were all keen to enjoy some chill out time so we made our way to the south-western tip of the island and the Paradis Beachcomber Resort at Le Morne. This is an incredible, five-star, luxury resort that delivers the “wow” factor from the moment you arrive. The main building houses superb restaurants, bars and lounge areas all under a fabulous thatched roof, constructed using sugar cane leafs. The luxurious rooms stretch out along the beach front with views of the palms and that turquoise sea. Sitting on my balcony and soaking it up I exhaled deeply and felt far removed from the world I had left less than 24 hours earlier. We dined at Dinarobin, a sister Beachcomber resort to Paradis and one that perfectly complements its neighbour, delivering a slightly quieter atmosphere and the utmost in sophistication. It’s another incredible five-star destination where the hospitality is of the very highest standard. The meal we enjoyed from the buffet at L’Harmonie restaurant was quite simply outstanding. After just a very brief visit to the bar at Paradis and then an incredible night’s sleep I felt suitably refreshed to take on our second golf course at Paradis Golf Club. I’ve been fortunate to play golf in some fairly striking settings over the years but this has to be one of the most memorable. The front nine is dominated by the imposing Morne Mountain – a world heritage site and one with a tragic history. The Morne peninsula was a refuge for runaway slaves in the early 19th century and the mountain top used as a lookout post, to spot the military despatches sent to recapture them. In 1835 a police unit was sent to inform the slaves they were freed after abolition but, when they were seen coming, many slaves chose to jump from the rock to their deaths rather than risk re-enslavement. The front nine at Paradis features some enticing holes. The second is just about driveable and there are two par-5s that are reachable for the longer hitters. The 8th is a superb short par-4. It’s only 295 yards but the green sits on the other side of a narrow stretch of lagoon and the ball must carry 285 to find the putting surface, if you choose to take it on. I’ll allow myself a little indulgence and say that I decided to have a blast and somehow caught it flush and online and found the back of the putting surface. Even a blind squirrel occasionally finds a nut. Of course, I three-putted. After a refreshing Phoenix (the local beer) at the halfway hut, we pressed on to the back nine. This half of the course is set along the shoreline of the beautiful lagoon. There are some incredible holes to be enjoyed but undoubtedly the most memorable is the incredible 16th. A par-5, it curls around the lagoon to a distant flag. The temptation is to cut too much off the corner and countless balls (including two in our group) fail to make the carry. This really is a fabulous hole and representative of what is a truly excellent course. A word should be said about the conditioning. For a resort course which sees extensive play, the surfaces were brilliant: The fairways springy and a joy to strike from and the greens pure and true. Top marks. There are, of course, a plethora of activities and sights to enjoy away from the golf courses on Mauritius. Those who enjoy water sports are spoilt for choice – There’s a kite surfing school, scuba diving, paddle-boarding and deep-sea fishing. We chose a more sedate option – A trip on a catamaran to watch the sunset. Sipping beers, eating barbecued shrimp and taking in the views of the coast while lounging on the prow… I had to pinch myself to make sure I wasn’t dreaming! Mauritius is only 65km long by 35km wide but the population is 1.3 million so, although you frequently have the feeling of seclusion and remoteness, it’s actually a fairly bustling place and getting around the island can take longer than you might expect. We made the drive from the south west tip, up through the capital of Port Louis to a new golf course on the northern tip of the island – a track called Mont Choisy. Only opened at the start of this month, we were among the very first people to have the privilege of playing on this excellent addition to Mauritius’s golfing portfolio. Another layout designed by Peter Matkovich, this is clearly a course that has been laid out with great consideration for delivering maximum enjoyment for golfers of all standards. It’s generous from the tee and there are multiple teeing options. The hazards are well placed but not overly punishing. There are interesting and challenging slopes and borrows but these aren’t unduly daunting or overly extreme. Volcanic rock piles and evidence of the old sugar plantation provide definition and focal points. Overall, every hole had me nodding my head in approval at the fairness and difficulty of the question being asked. Sometimes new courses have that immature feel, the comment is often, “It will be great when it beds in.” This is not the case at Mont Choisy. The surfaces are already established and the layout has the feel of one that has been there for far longer. Although the front nine at Mont Choisy is excellent, the real pace and excitement of the track builds towards a climax on the back nine. I think this is a great example of modern design that, just as the golfer maybe starting to tire, the course throws some truly great holes into the mix to re-enliven the experience. The 13th is a tremendous short par-4 protected by water hazards and the 15th is a wonderful par-3 to an island green with the old plantation tower as a backdrop. Mont Choisy presented a very different golfing experience to the first two courses on our trip and we discussed this over another marvellous dinner at the nearby 5-star Beachomber resort at Trou aux Biches. As we savoured a smoked Marlin salad and a rather fine South African white, we remarked that we had seen first, an inland championship course reminiscent of the best resort tracks of Spain and the Algarve at the Heritage, a truly memorable track at Paradis with stunning surrounds and then a brilliant, contemporary design at Mont Choisy that showcases the pinnacle of modern golf course architecture. A quick word on Trou Aux Biches – we were only there for one night but that was enough to see that this, again, is an incredible resort that delivers the ultimate in tropical luxury and service. We were invited for pre-dinner drinks in one of the incredible family suites, complete with private swimming pool and outdoor bath! What a place. Unfortunately, our trip to Mauritius was coming to an end but I’d been given enough of a taster to put the island very high on my list of “must return to” destinations. There are seven further 18-hole golf courses to play and so much more to see and do. Before heading out to this Indian Ocean paradise I wasn’t sure what the golf would be like. I wondered if it might be a beautiful but perhaps more of a sideshow to the romantic resorts. This is definitely not the case. The golf courses we saw were top class and all maintained in extremely good condition. Mauritius is a golfing destination and one that will deliver enough to keep even the most avid golfer occupied for a 10-day or two-week trip. Add into the mix the fact that this is a supremely beautiful place with history, culture, sporting and other leisure offerings, incredible seafood, tropical fruits, endless beaches and delightfully warm and safe waters, and you have quite a package. I found that Mauritius lived up to my childhood expectations, no actually, it surpassed them: Top quality golf in a semi-surreal tropical paradise… What could be better than that? Beachcomber Tours Sample prices. All prices are per person for seven nights including flights and transfers.